This is a serious horn for cyclists. 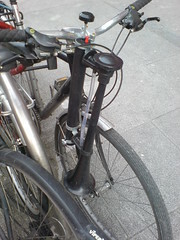 I came across it outside the Stephens Green centre and couldn’t resist trying it out. You grab the handle in front on the forks and lift and press. It is car horn loud! Great for drivers in the cycle lane.